← Happy accidents with the Mad Dog on the Spiral Staircase! You can’t drive too fast on these small country roads in rural Ireland as you never know what you might meet. The roads can be narrow about the width for one car and one has to be vigilant as you could meet cattle or sheep wandering these “Boreen’s” (a little road). It was on one of these roads that I came across Matt Conway with his Donkey. Seeing them together it was reminiscent of a scene from ‘The Quite Man’ and I was half expecting a flame haired Maureen O’Hara type girl to emerge from a nearby field. The scene before me was a world removed from the Ireland that I live in and I felt that I had been transported back in time to the 1950’s. Stopping the car I was more interested in making a portrait of the man but realised that I would have to be tactful and diplomatic in my approach. 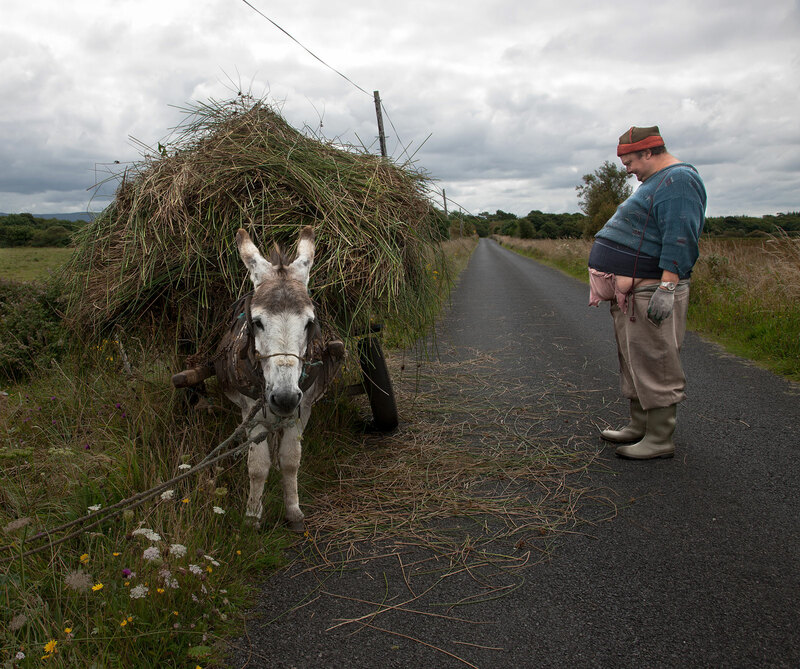 I introduced myself and asked could I make a picture of his Donkey, he agreed and I spent about half an hour photographing both of them as Matt loaded the cart with grass and hay before they both traveled the short journey home. The resulting photograph of Matt contemplating the cart’s load as it appears weighted down on one side. The only sign of modernity in the photograph is the watch that Matt wears on his wrist otherwise the picture is in some way a throwback to old traditions that have now all but disappeared in rural Ireland. This entry was posted in donkey, farmer, ireland, photography and tagged donkey, farmer, ireland, people, photography, rural. Bookmark the permalink. I think the donkey needs help. I Think the man should help the donkey. How sad.